Home » FARMHOUSE » 19 Wow-Worthy Farmhouse Kitchen Cabinet Ideas that are Versatile and Minimal! One trend that can rock just about any kitchen space with a pleasing and bright outlook is farmhouse inspired cabinets that go for versatile color schemes, loads of wood and antique touches, and minimal structures for storage as well as decoration items. Here are 19 Farmhouse Kitchen Cabinet Ideas that are another word for Wow! A kitchen cabinet right above the stove, this rustic thing of chic features a natural wood texture with its little dents and imperfections making it stand out. The pallet board cabinet adorned with a fluffy wreath comes with an inclined lid and will let you store pots and pans or other kitchen essential you want to keep handy. This inspiration by Our Vintage Home Love makes the most of the space underneath the whole kitchen counter by adding in storage solutions that have got drawers and cabinets both. Matching the glossy white countertop with the subtle grey hue in delicate matte, the cabinets have got shiny black door knobs and drawer pulls. Old looking, rustic oak cabinets that almost lost their charm get a glorious makeover, yielding brand new-looking cabinets in a breathtakingly bright white. Not only are the extra cabinets that simply held crap are removed and replaced with new pieces of functionality, everything is sanded and coated in layers of glossy white with simple round knobs. As much as we love this compact kitchen cabinet with a farmhouse essence, we also adore that decorative ironstone plate mounted on one side of the cabinet, having a black and white farm sign hanging underneath. The L-shaped cabinet sports doors with lovely glass panes fitted inside the frames, while the cabinets under the counter keep it all wooden and white. Going for neutral hues, specially white can dominate a farmhouse kitchen just like magic. And that’s exactly what this kitchen cabinet with 6 individual drawers at the bottom and one cabinet door on top does. Each of the drawers is adorned with two antique looking pulls in black, while the cabinet above sports three separate compartments for keeping cookbooks to decorative pieces. The unique hue of these kitchen cabinets complements the travertine tiles and glass mosaic like nothing else. The top cabinets are first coated with Annie Sloan Chalk Paint in old ochre, sanding the edges to reflect the surface underneath to get a weathered texture. 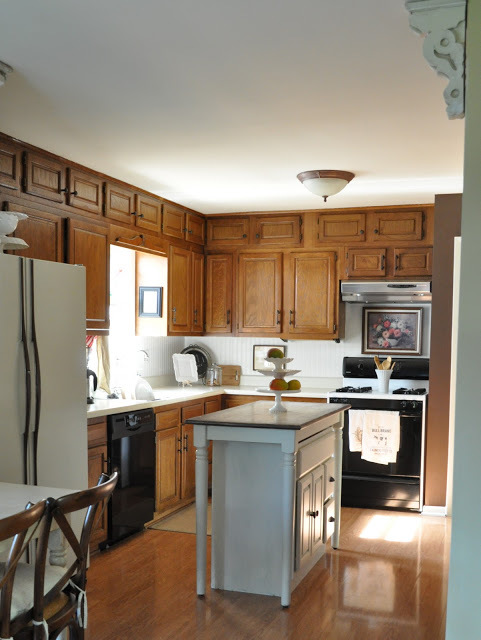 On the other hand, the bottom cabinets underneath the counter go for a dark wood stain with a worn out touch yet again. For the final touches, decorate the middle cabinet with a luscious wreath in bright green for a much needed element of color. Apart from having endearing cabinet doors and drawers under the kitchen counter, this kitchen storage inspiration also features vintage-style wall mounted shelves with designed brackets. The cabinets and the countertop are in perfect contrast to each other, wherein the glossy brown counter goes well with the neutral hue cabinets and metal knobs for the doors. Almost the whole wall space in this kitchen shared by Dag Marble Asdale has been employed to work up storage cabinets, yet making sure it doesn’t look overdone – all thanks to the chic design and the glorious texture of the cabinets. While the wall mounted ones go for an open front and smaller shelves, the under-the-counter storage comes with fine matte white for the drawers and doors, having black handles and knobs complete the look. The wonderful tone of these pastel kitchen cabinets done in a soothing aqua forms the ultimate focal point of this kitchen space. Keeping everything low key, the remaining space goes for neutral hues, including cream, light brown for the kitchen island counter and whites. The placements of the cabinets are not only clever, but truly vivid. Cabinet and decorative shelves – the two join hands together to yield a picturesque kitchen storage solution. This one features two wall cabinets with glass doors on either side of a group of shelves, having everything worked up in a single construction. A beautiful pastel shade coats the cabinets and the shelves, also coating the cabinet doors under the sink.